Debido a restricciones por parte del fabricante no podemos enviarle este artículo. Ultimate Performance products to the European Union. 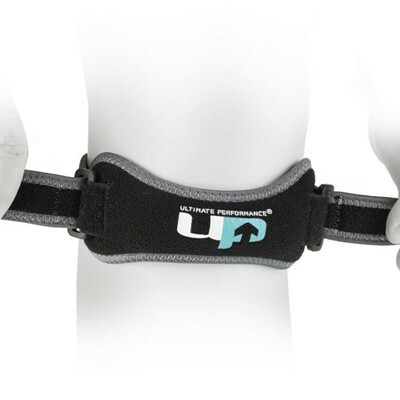 The Ultimate Performance Advanced Patella Strap provides compression and support, helping to relieve patella tendon pain. Ideal for relief and prevention of patella pain associated with running and jumping. A compression tube placed targeted pressure on the patella tendon to take the load off of the tendon thus providing adequate pain relief. The adjustable strap ensures a personalised fit and providing just the right amount of compression that you like. A soft neoprene blend provides a firm, support and promotes improved healing of the tendon. The Advanced Patella Strap is one of the most comfortable and supportive patella straps on the market. Bi-lateral adjustments and the engineered contoured shape provides maximum support and comfort for the patella tendon during exercise. The moisture wicking fabric wicks sweat as it's produced then transfers it to the outer layers of the fabric where it can then be easily evaporated, ensuring you stay cool, dry and comfortable. Recommended for: patella tendonitis, Osgood's Schlatter disease and irritated kneecap (chondromalacia) during the competition, training or all day use. Adjustable Strap - Provides additional support and compression. Soft Neoprene Blend - Provides a firm, support and promotes improved healing of the tendon. Contoured Shape - Provides maximum support and comfort. Moisture Wicking Fabric - Wicks sweat and dries fast. Care - Hand wash with mild detergent, Do Not use fabric softener or bleach, Allow to air dry, Do Not use heat.